Star Trek is an enormous and complex cultural entity whose impact on politics, technology, and storytelling are undeniable. For half a century, it has appealed to a vast and varied audience, and it means something a little different to each viewer. In this season of Infinite Diversity, Deadshirt founder and Trek superfan Dylan Roth explores individual Star Trek episodes and films, each with a different companion, to expand our understanding of this rich fictional universe and the one in which we live. Dylan: First thing’s first, let’s get to know the first-ever guest co-writer of Infinite Diversity, Leah Starker. Leah, you and Trek go way back. Where does your relationship with the franchise begin, and what does it mean to you? Leah: I honestly cannot remember a time when I was not a fan of Star Trek! My parents are fans—I remember helping my mom do the makeup for her Jadzia Dax Halloween costume when I was a kid—so it was always on TV in my house growing up. Trek for me has always been this very aspirational future, that at its best is about how we as a society want to grow and mature—reflecting what we see as problems in our own times, and how we can overcome them. I’ve also been involved in fandom, including slash fandom, since I was a teenager, and you can’t be a part of that community without having a lot of love and respect for fifty years of fans and what they’ve created in response to this idea of the future. Dylan: I understand that you have a particular affinity for today’s episode. Leah: I do! It’s the one I always recommend to people who are curious about The Original Series. I think it’s the perfect self-contained episode, with a healthy balance of camp and heart. Dylan: Let’s dive right into it, then! Leah: So, while Scotty is tasked with fixing the life support system using what looks like an ice-cream machine and positive thoughts, Spock suggests that whatever creature they’re looking for could be a silicon-based life form, which explains why it isn’t showing up on any of their scans. Faced with this unpredictable foe, a team of redshirts is deployed to seek it out. 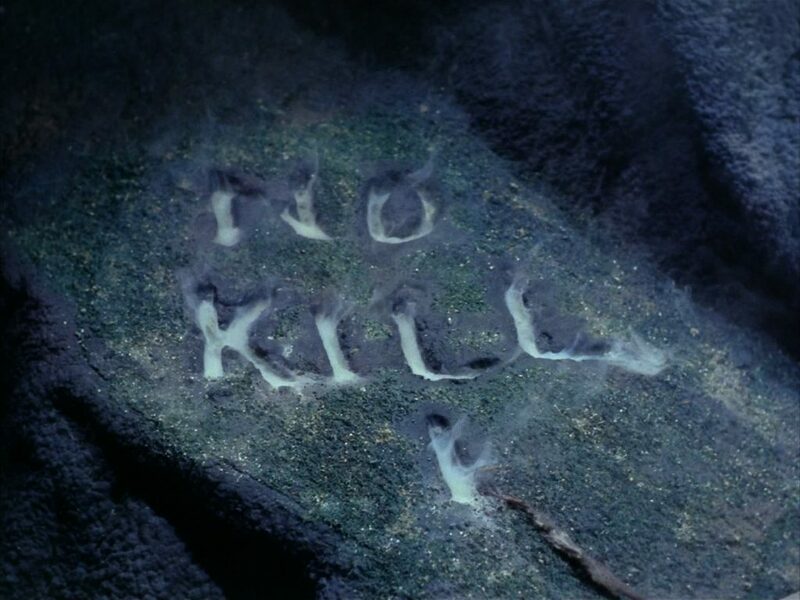 Kirk and Spock come face-to-rock-outcropping with the creature, manage to injure it with a modified phaser, and eventually find themselves in a standoff: just our intrepid heroes, a foam-rubber blob of a monster, and thousands of mysterious orbs in a cave. Dylan: Kirk and the wounded rock beastie both choose not to draw first blood, the first sign that the “monster” may not be exactly that. 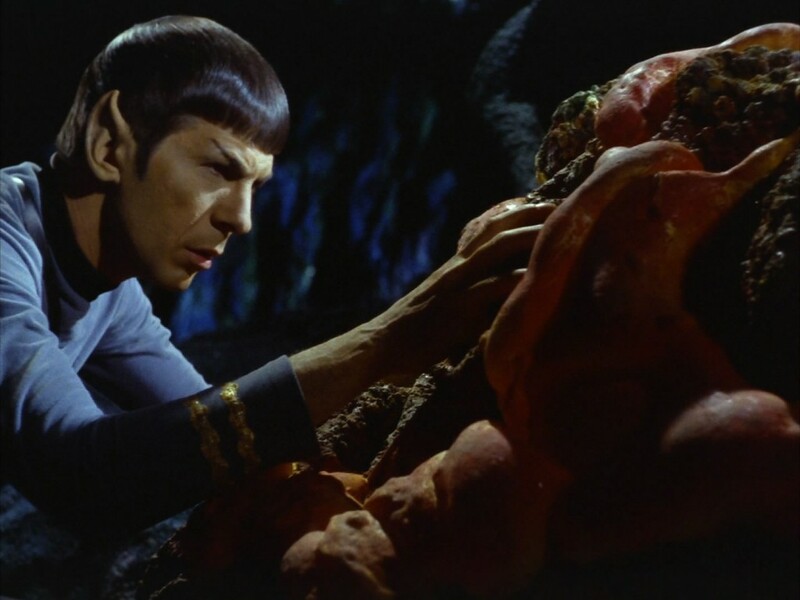 The stalemate is broken when Spock, using his Vulcan Mind Meld© ability, communes with the creature and learns the terrible truth: the Horta (that’s what the creature is called) attacked the miners only after their operation shattered thousands of her eggs—those mysterious silicon orbs they’ve been finding everywhere. Unable to communicate with the human intruders, the Horta’s only recourse was to take action. But now, thanks to Kirk and Spock’s phaser precision, she’s dying, as will her unborn children…unless Dr. McCoy can pull off a miracle. Leah: Kirk follows the Horta’s instructions to find the missing piece of the life support reactor, and amid rising tensions between the miners (who want to kill the Horta) and Starfleet, he proposes a solution that benefits everyone: if the miners stand down, the Horta and her newly-hatched children will use their corrosive secretions to create tunnels that the miners will use to access the planet’s mineral deposits. McCoy uses thermo-concrete to create a silicon bandage for the mother Horta, and the Enterprise continues on her way through the stars. Leah: So, one of the reasons I think this is in many ways the perfect TOS episode is because it has so many examples of plot points and moments that have become really iconic. There’s a scene of Kirk briefing a team of redshirts, one of whom almost immediately dies screaming. Scotty manages to fix archaic technology with spare parts he scrounges up, and Dr. McCoy actually says “I’m a doctor, not a bricklayer!” The entire episode is spent running around nondescript cavern sets, and the Horta is nothing more than a person crawling around wearing a painted rug—and yet, it’s a really compelling story where the problem is solved by learning how to communicate. Dylan: I totally agree that this episode captures the quintessence of Trek—which is sort of crazy because this is a show about a starship crew and they spend none of it aboard the starship! Apart from that, all the elements are there. I also think “The Devil in the Dark” is an episode that all kinds of fans can appreciate. It’s an action-adventure piece, it’s a mystery, and it’s got a cool sci-fi angle to it with the silicon-based organism. There’s a message of tolerance and cooperation, which satisfies those of us who love to philosophize around Trek. It’s also got that cheesy creature and Nimoy’s hammy Mind Meld acting, which means if you’re the kind of viewer who enjoys classic Trek for the kitschy nostalgia, this episode is probably second only to “Arena” for you. Dylan: While it excludes most of the secondary cast (no Uhura or Sulu this week), “The Devil in the Dark” is a great example of the Kirk & Spock relationship, and to a lesser extent, Kirk, Spock, and McCoy as three parts of one heroic whole. Kirk is in command, always the brave, decisive problem-solver. Spock is analytical, feigns detachment, but actually cares deeply for his friend. McCoy doesn’t get quite as much screentime this week, but he gets one of his best moments, ingeniously healing the Horta. “I’m beginning to think I could cure a rainy day” is one of my all-time favorite Bones lines. Leah: The three of them play off each other so well—both at the beginning of the episode, where Bones refuses to believe in the possibility of silicon-based life and Spock frostily refuses to speculate further on the subject, and at the very end of the episode, where Spock reveals that the Horta found his ears particularly attractive. The banter and teasing is charming instead of mean-spirited, and it’s clear that the three actors are enjoying themselves, as well, which is always nice to see. Dylan: I love that Spock more or less has the mystery of Janus 6 solved in the first 5 minutes of the episode. One look at that silicon nodule on Chief Engineer Vanderberg’s desk gets the wheels a-turnin’, but like the good scientist that he is, he spends the rest of the story gathering evidence and testing his hypothesis. 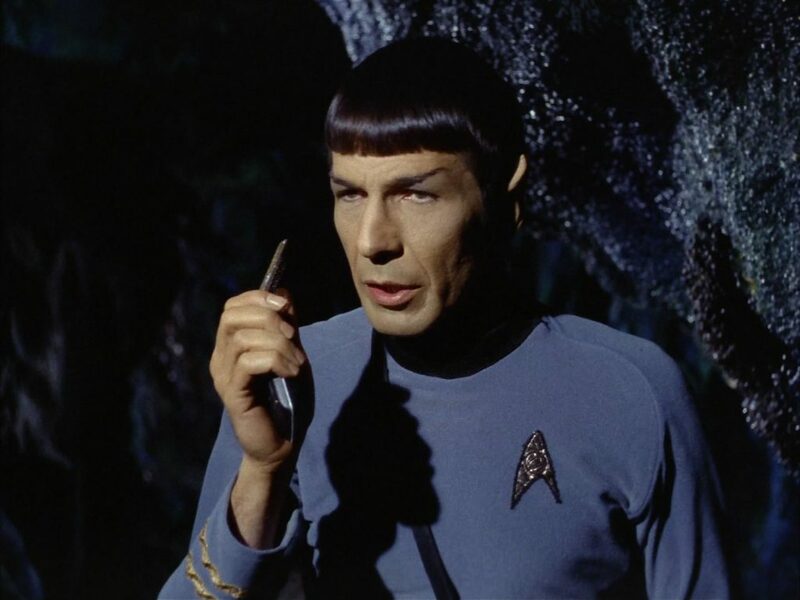 His concern for the Horta as a member of an endangered species is expected, and yet his plea for Kirk to kill her before she can kill him is also in character—Spock is all logic until the moment you threaten to melt his buddy, then that human side (or the more intense Vulcan side, if you prefer) starts to peek out. Leah: Look, there’s a reason these two have been fascinating fans for decades. When the chips are down, they will do anything for each other. Leah: The Kobayashi Maru and the no-win situation is an important way that Star Trek has matured and deepened over the years, but to me, early Star Trek is really about finding optimistic ways for everyone to win. 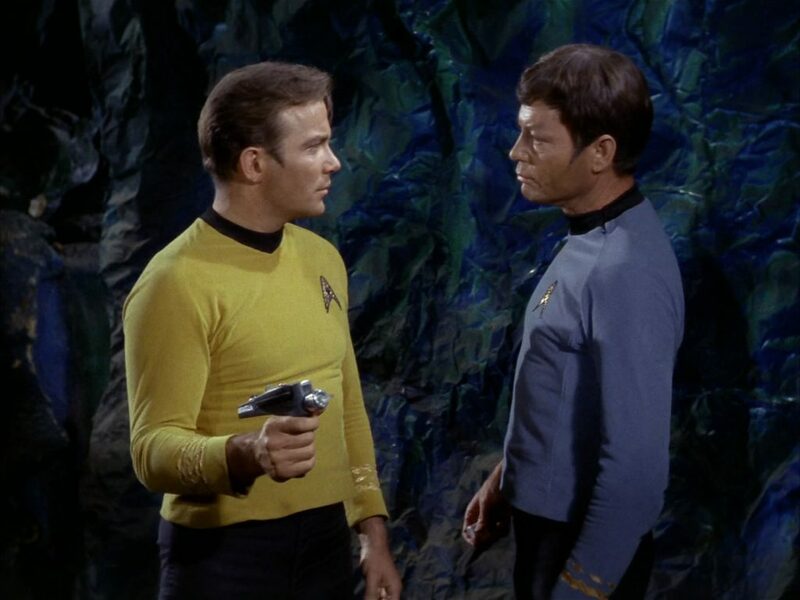 Kirk often gets stereotyped as being brash, but he’s quite cautious in this episode– when he and the Horta are staring each other down, he is responsive to her movements and follows her lead, which sets the stage for Spock’s communication attempts. Additionally, the way that humanity is positioned as the ultimate aggressor in the situation is extremely important—I think that in a lot of ways, the biggest strength of the episode is that it forces the characters to view a creature they once considered a monster as an intelligent, rational being. 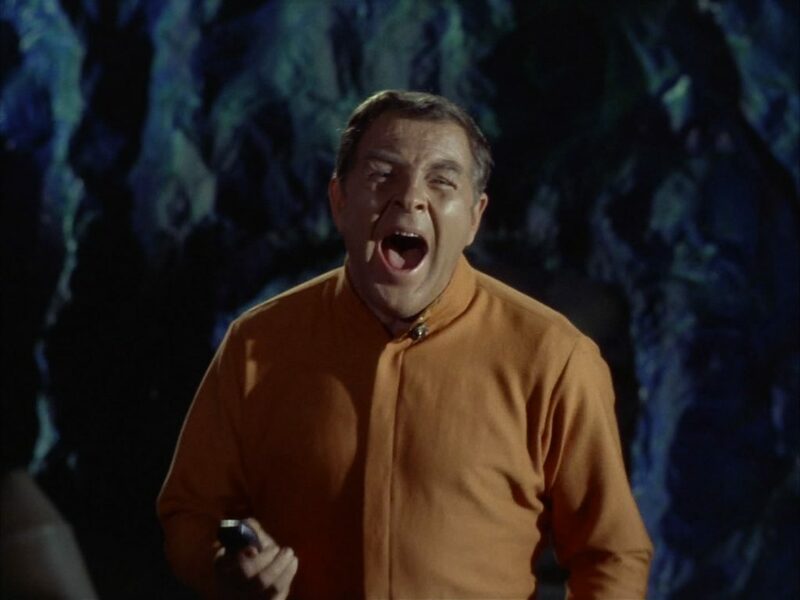 Dylan: I appreciate that once Kirk explains what’s happened—that the Horta’s violent actions were a response to the extinction-level threat presented by the miners—the humans cool it almost immediately. None of them says, “I don’t care, she killed my friend.” They all recognize immediately that they fucked up and the cycle of violence has to end. They put their desire for revenge aside effortlessly. They do also skip past a very necessary apology straight to “yeah but how are we supposed to keep on mining?” But Kirk’s proposal of working together to mine the planet is met with zero resistance. They would all rather work together than fight one another, even the Horta. Like you said, everybody wins. Dylan: If we’re talking about quintessential episodes that have all the Trek elements, I have to recommend “The Corbomite Maneuver.” It’s a very different story with a very similar message, plus it takes place almost entirely aboard the Enterprise, if that’s something you were missing in this episode. Leah Starker is a friend of Deadshirt who is thirsty for space. Infinite Diversity will return in two weeks with a new guest! Follow @DeadshirtDotNet on Twitter to keep up with what’s new here on Deadshirt, and feel free to tweet @DylanRoth with suggestions for future topics for Infinite Diversity, or just to talk about Trek. He truly never gets tired of that. Next → Next post: Deadshirt is Watching… What does it mean to be human?